TIJUANA, Baja California, Mexico — After watching the motorcycles run on Friday in the unique, three-day, split session race, Josh Daniels kept a huge crowd of spectators entertained Saturday to pace two other RPM drivers to the SCORE Overall and SCORE Trophy Truck top three leader positions for the first half of the internationally-televised Tijuana 21st SCORE Desert Challenge. The event is Round 3 of the four-race SCORE World Desert Championship. Sunday the three-day race will conclude. Having held over 150 races in Mexico in the last 40-plus years, this is the first time that SCORE has held a race that has both started and finished in Tijuana. With entries from 15 U.S. States and 14 countries, the majority of the cars, trucks, UTVs, will finish their race on Sunday. Motorcycles, quads and a few car/truck classes raced on Friday in two sessions to open the event. As a substitute driver for Justin Matney, co-owner of RPM Racing of Bristol, Tenn., Daniel started fourth in the first half of the elapsed-time race to hold off his teammates to hold the overall lead heading into Sunday’s finale. Driving in the No. 4 Geiser Bros-built 4-wheel drive Chevy Rally truck, Daniel, of Vista, Calif., covered the first three 23-mile laps in a time of 1 hours, 38 minutes, and 16 seconds to pace the field. Growing into the most powerful racing team in the desert, RPM drivers also ended the first day second and third on the leader board and a fourth driver leads the SCORE TT Legend class. With the course running in a counter-clockwise direction, the car and truck classes, including the marquee SCORE Trophy Truck, SCORE TT Legend the unlimited Class 1 and Trophy Truck Spec divisions will run the final half of their race in one of three groups on Sunday. Racing for these classes will start at 8 a.m. and finish at 4:25 p.m. (PT). The featured SCORE Trophy Truck, SCORE TT Legend and Trophy Truck Spec divisions will finish their race on Sunday starting at 2:25 p.m. (PT). The unique-format race is being held at a spectator-friendly start/finish line and ‘hot pit’ area located on the southeast outskirts of Tijuana to the east of the popular Rancho Casian area off of Boulevard 2000 (Highway No. 201). The actual start/finish line area and hot pits is located 2.3 miles inland off of the highway. Among the racers class leader their respective classes after Saturday’s first half of the race were: Marc Burnett, Lakeside, Calif. (Pro UTV FI, Can-Am Maverick X3), Kristen Matlock, Alpine, Calif. (Polaris RZR XP4 1000), Dan Chamlee, Santa Barbara, Calif. (Class 7, Ford Ranger), Noah Ostanik, Carlsbad, Calif. (Class 8, Ford F-150), Cesar Fiscal, Tijuana, Mexico (Class 1/2-1600Romo-VW), Rafael Aguirre, Monterrey, Mexico (SCORE Lites, Foddrill-VW) and Matteo Bocelli, Italy (Baja Challenge, BTC-Subaru). Also leading their respective classes after Saturday’s first half of the race were: Elias Hanna, Ensenada, Mexico (Trophy Truck Spec, Chevy 1500), Broc Dickerson, Brawley, Calif. (Class 10, Alumi Craft-Chevy), and Shelby Reid, Apple Valley, Calif. (Class 1, Jefferies-Chevy). Unique for SCORE, the 21st the SCORE Desert Challenge is using a race format that has all classes racing in five different groups for a total of six laps over a surprisingly rugged 23-mile race course (138 total miles) split into two, three-lap sessions. Currently second and third on the leader board overall and in SCORE Trophy Truck are Carlos ‘Apdaly’ Lopez, Tecate, Mexico in the No. 1 RPM Racing Chevy Rally Truck and Eduardo ‘Lalo’ Laguna, Mexicali, Mexico, in the No. 9 RPM Racing Chevy Silverado as a substitute driver for Germany’s Armin Schwarz respectively. Leading the SCORE TT Legend class is Jeff Geiser, Phoenix, as a substitute driver for RPM co-owner Clyde Stacy, in the No. 5 RPM Racing Chevy Silverado. All four of the RPM Racing trucks were built by Geiser Bros of Phoenix. With 132 official entries, there are entries from 15 U.S. States and 14 countries. Nations are USA, host nation Mexico along with Austria, Brazil, Canada, Denmark, France, Germany, Great Britain, Guatemala, Italy, New Zealand, Spain and Switzerland. States with entries so far are Arizona, California, Colorado, Florida, Idaho, Iowa, Nevada, New Mexico, North Carolina, Pennsylvania, Tennessee, Texas, Virginia, Washington and Wyoming. Running predominately on land owned by prominent developer Grupo Musquis, SCORE Race Director Jose Grijalva confirms that this year’s course is extremely beautiful and picturesque with more places to pass than last year’s course. He further stated that around four miles was actually part of last year’s course that started and finished just south of Rosarito Beach. The course runs in a counterclockwise direction with two checkpoints. Checkpoint 1 is at race mile 12.05 and Checkpoint 2 will be at race mile 17.8. Most of the terrain for this race course is on mountains, hills, valleys and local trails. In addition to Grupo Musquis land, the course also runs through areas like La Nopalera, Los Pancho’s and Ejido Mesa Redonda. 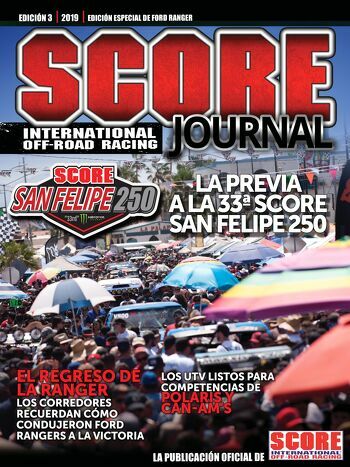 With less than two months remaining before the historic 50th anniversary race of the iconic BFGoodrich Tires SCORE Baja 1000, the City of Tijuana and the Tijuana tourism groups has given SCORE a multi-year contract that moved this race from nearby Rosarito Beach where it was held last year. While this is the first time in Tijuana, the SCORE Desert Challenge has been held 20 previous times since it first began in 1995. It was held in Laughlin, Nev., USA, from 1995 through 2012, in Plaster City, Calif., USA, in 2014 and in Rosarito Beach, Baja California, Mexico in 2016. In 1967, the first SCORE Baja 1000 (then called the Mexican 1000) started at the bull ring in Tijuana and the 1995 SCORE Baja 1000 started in the wash near the Hotel Lucerna in Tijuana but no SCORE race has ever finished in Tijuana before this year. In addition to the two starts in Tijuana, SCORE Baja races have been held numerous times in Ensenada and San Felipe, several times in La Paz, a few times in Mexicali, Santo Tomas, Ojos Negros and Cabo San Lucas, and once each in Loreto and Rosarito Beach. The race is being filmed to air on a later date on the El Rey Network as a one-hour special. Official SCORE Sponsors: BFGoodrich Tires-Official Tire, Title Sponsor of this year’s SCORE Baja 1000 and a top sponsor of the 50th SCORE Baja 500 in 2018, Monster Energy-Official Energy Drink, King Shocks-Official Shock Absorber, RACELINE Wheels-Official Wheel, Axial R/C-Official R/C Vehicle, El Rey Network-Official Television Partner, Wide Open Excursions-Official Arrive and Drive Company, Crystal Bay Casino-Official Casino. Tijuana SCORE Desert Challenge Special Partners: XXII Ayuntamiento de Tijuana, Baja California Secretary of Tourism, Tijuana Comite de Turismo and Convenciones, Comite de Marcadotecnia Turistica, Asociacion de Hoteles del Noroeste. JUSTIN MATNEY, No. 4 (Leader after Friday) CO-DRIVER JOSH DANIEL SAID: I had to be patient out there. For sure, I mean you can only drive what you can see. If you’re pushing the whole time and it’s dusty, you’re never going to make it. You’re going to be off the side of the road or break the truck or get a flat — something like that. In these short races you can’t afford any mistakes. It’s super, super rocky out there and the more the Trophy Trucks run every lap there were just new boulders everywhere. It’s just really, really gnarly. A couple of spots we could open it up but that’s about it. There weren’t a lot of spots where you could really just get with it. Tomorrow, we probably do the same thing we did today. The course knowledge is huge, knowing where those big holes are and just trying to stay out of everybody’s dust. That’s the hardest thing. I guess the three laps today are going to prepare us for where we know where to go tomorrow. I’m diving both days. CARLOS “APDALY” LOPEZ, No. 1 (Second after Friday) — Because of the rocks, we were taking care of the tires the first two laps. Then, the last lap we got very aggressive. We have BFG so we are happy because we know what we can do on that equipment. The course was rough, rocky, dusty and challenging. We started off carefully, trying to save the tires because of all the rocks and find out where we were. Then, get aggressive on the last lap. Tomorrow I will start in front so it’s going to be an advantage. There won’t be dust in front of me. That’s the plan. JEFF GEISER, No. 5L (Leader after Friday) — The race was awesome. We’re in the Legends class so we just gotta make it around here. Apdaly (Lopez) started right in front of us and he sets a hot pace so we were dust-free the whole time. We were just out having fun. About blew a corner up here and got on the binders a little too hard and blew a brake line. We made it into the pit and they switched it to fix the brake line and that was it. That was it, we had a trouble-free day. We’re looking forward to tomorrow. SHELBY REID, No. 168 (Leader after Friday) — About mile 7, 8 I missed the corner and I couldn’t get it back around. It was one left into a sharp right and I couldn’t get it to the right so we started going sideways. I kept gassing it and the car kept going more sideways until we were going to be backwards in the course. So, I. spun it back around and, luckily, found another little trail there. That was my first lap. Second lap we found where they’ve been cutting those corners. The second two laps we went straight up and that was a lot better. Key factor was staying out in front, I was peddling, like “come on, come on, you can do this, you can do this” all the way in and luckily I stayed out front because I’m telling you I felt bad for those people in the dust. But, the wind’s blowing so that’s good, that’s going to help. You just have to see everything. There are so many rocks out there. The car did really good, the brakes are not so good. I was pumping them and pumping them and they would go straight to the floor. I had to pump them on every corner and when you do that you start going everywhere, so that was tough. We gotta work on that tonight for Danny (co-driver Danny Ebberts) ’cuz he’s not going to like that tomorrow. BRIAN WILSON, No. 138 (Second after Friday) – CO-DRIVER KYLE QUINN SAID: It was good out there. It was rough in this little 12 car but I think our strategy paid off. No problems, right off the start we just kind of cruised. We didn’t get to pre-run so I used that first lap as my pre-run. After that, I picked it up each lap and watched the competition fall out and we kept going. Brian Wilson will drive tomorrow. We’ve been teamed up all year. He will start first with the invert so I think we’re set to, hopefully, stay on top. AL TORRES, No. 114 (Third after Friday) — It was pretty tough out there, a lot of drop offs. You had to be really careful not to get off course. We were trying to keep our pace. We came out four or five cars back so we knew we were going to have a hard time with the dust. We knew we had to maintain a consistent pace today. As far as problems, at the end of the second lap the motor stalled. I think we lost a fuel pump. It just died on us on a turn and got us sideways. I had no power to straighten the car. ELIAS HANNA, No. 275 (Leader after Friday) — It was a clean run, a little dusty on the first couple of miles. I knew I had to push so hard in the beginning so I could have a clean dust running behind the Trophy Trucks because they’re going to have a little more speed than me. That gap was going to be in my favor. We caught the first one on mile five. We were on his bumper for maybe three miles. I decided to risk it and get it over with and pass him. Then we caught the other one about mile 10. After that, clean dust, the truck worked so good. I had to be super careful the first couple of miles because of all the rocks. And, now there are lines all over the place on the course. You just have to be real careful with the rocks. Tomorrow, I just have to keep it in the course. If you go outside you’re going to get a flat or something. We did a pretty good job today. .
BRIAN GOLDSTEIN, No. 229 — (Third after Friday) CO-DRIVER MATT McBRIDE SAID: Race was good, really dusty, no place to pass. We just kind of played follow-the-leader. It was fun, though. We just drove it straight through. We’re in the points chase so for overall for Trophy Truck Specs so we did good. CHARLES DORRANCE, No. 299 (Fifth after Friday) — Given the limited seat time in this truck and improvements that we’ve gone through, I think the truck ran really, really well. It was a little loose in the rear end but with a little bit of correction on my driving style and we’ll be going a little quicker next time. That correction would involve the sway bar. We worked with it, moved it around a little bit. With the dust out there, you drive what you can see. If you can’t see, just slow it down, let it clear. That kept us out of the big rocks. We were seeing guys on the sides of the road and we were able to go around those guys just because we slowed down. It may have cost a little on time, but I’ll take it. My teammate Larry Job is going to drive tomorrow. He was sitting with me today so he’s going to have the same view as I had. He’s going to be dodging some rocks, take good shortcuts and drive a little smoother. Hopefully, we’ll do pretty good. It was a good course, not a lot of passing lanes but it was short enough that I didn’t see a lot of people to pass, anyway. BROC DICKERSON, No. 1023 (Leader after Friday) — We just started charging off at the beginning. We knew we were going to be sucking dust. We’re racing for points. We’re leading right now and we don’t want to throw it away. We had to pick off as many positions as possible and not make mistakes, ending up on the side of the road broken down. We were just pushing, we’d catch them in the dust, then we’d wait until we had our chance to pass them and, then, we’d make our move. It went pretty good. The tires held up, no flats on our BFG Tires. It was perfect, no issues at all with the car. Everything ran perfect and we’re happy to come out on top. The course was rocky and silty. The dust was horrible, vision was horrible. Other than that, it was fun in some parts. For tomorrow, we’ll just stick with what we have and go for it. RAFAEL NAVARRO, JR., No. 1000 (Second after Friday) — I did all three laps today. I’m just having fun, really, and managing everything all the terrain. With this kind of environment in TJ, you race on all the hills and it’s all single track for the most part. And, then, there are a lot of rocks so you’re trying to do your best. You have to watch out for the dust as well. We just kind of battled all the elements today, had fun and ran our race. It is what it is. We, probably, ended up second on corrected time, which is fine. It’s exactly where we want to be. You don’t want to be fourth or fifth and you know you can’t be winning every day. We’ll see tomorrow. We still have another three laps and the way the course is out there, I saw a lot of carnage out there, mistakes, so you never know. I only had a chance to pre-run once. I got into San Diego last night at 9 so I didn’t have a lot of time to pre-run because I have a lot going on. So we finally got out there and the course has changed a lot. After pre-running all weekend, the motorcycle race on Friday and then you had the earlier heat this morning. The course is constantly changing. Usually we plan a little bit better. We do our pre-running, our homework and we have all these good lines and, this time, we just didn’t have that luxury. This race, we learned, we were learning on each lap. By the third lap we figured it out. I had my co-driver marking wait points dangers and things as we were going. It was quite comical. On top of that, I plugged my helmet in staging so we couldn’t hear each other. Literally, we ran the entire race without being able to communicate with each other over the intercom. We had to use hand signals the whole way and that was pretty interesting and funny in itself. We’ve been doing this long enough together so we just got it going. JUSTIN DAVIS, No. 1085 (Third after Friday) — Race started OK, but by the middle of the first lap we lost all gears but second and third. I tried driving and got around a bunch of racers. Then, I made a mistake and put it in a ditch for about three minutes. Got out of it and then drove the wheels off of it, tried to make up as much time as we could. It was just one of those days. I couldn’t get in a groove. Every time I would get in a groove, something would happen. We have tomorrow so we will try to get them back. We’ll get ’em tomorrow. REINALDO VARELA, No. 1092 (Fifth after Friday) — CO-DRIVER GUSTAVO GUGELMIN SAID: For us it’s pretty rough in (North) America. We’re not used to this kind of terrain. I did first lap. We were a little bit slow because of the rocks. After that, second lap and third lap was much better so we could push. On the first laps I saw the rocks and we had no punctures so we could push on the second and third laps. I think for tomorrow, we’re going to start pushing from the beginning. to try for a better result. I think it was a very good result for Brazil. We’re very happy and tomorrow we hope we can push more and try to be in the front. We have about 3,000 people in Brazil watching on social media. It’s pretty amazing so we are inviting some Brazilians to come over here and race. I think next year we’re going to have more people from Brazil racing Baja. NOAH OSTANIK, No. 844 (Leader after Friday) – The truck ran great, BFG tires did fantastic. We had the Regulators crew out here today. They did a wonderful job and we had a great time on the course. Had a lot of fun kicking the crap out of those UTV’s all day. We’re stoked on how this thing ran and it’s a great tune up for the 1000. We’re really excited. CESAR FISCAL, No. 1644 — (Leader after Friday) — It was very dusty out there because we started behind those 29 and 19 cars (UTV’s). We are faster and it was very dusty behind them. No problems with the car. Everything worked good. It was a good, clean race. ROBERTO ROMO, No. 1601 (Second after Friday) — It’s a really dusty race out there. That was the first time we started behind. We started behind the UTV’s. I know most of them are faster but we caught all the slower ones but it’s really hard to pass. Maybe it’s not a good idea. It’s a really fun course if you can drive with no dust. But if you’re in the dust and you step on the gas you don’t see someone who might stop in front of you. You can end up going in a hole or hitting a rock. The vehicle is in good shape for tomorrow but we’ll check it out today. MIGUEL BONILLA, No. 1240 (Second after Friday) — On the first lap there was a lot of dust. We couldn’t see anything. But, we took care of our tires and our team and we did our best so we could push and push and not get a flat. On the third lap it was pretty clear and we could push a little more. It was a very tough race, lots of rocks. We’re fighting for a championship and we’re very happy about today. We would like to get on the podium and we’re very happy with what we did today. We picked up some good details about the course today so we can push a little more tomorrow. MARK McNEIL, No. 501 (Leader after Saturday) — We had a good run. No flats. That was the biggest thing we were worried about. We didn’t get stuck in a ditch. The dust was terrible the first and second lap. The third lap got cleaned up a little. We’re really happy. We didn’t put it a ditch and we’re here at the finish line, the first car here. The biggest concern was the dust and the ditches. Around race mile 8 there are ditches on the left side that we were really worried about. The first and second lap we at that point were catching cars. We kept it cool. We didn’t have any problems and we didn’t have any accidents. We kept on the course. I’m not driving tomorrow. My dad will have to deal with that, he said when asked about driving the second segment after the course gets torn up even more today by the trucks. ALONSO LOPEZ, No. 2949 (Second after Friday) — We are so happy. It was what we were expecting. We knew that it would be a dusty day, especially on the first lap. We started 12th out of the pack of 13. We can’t complain about the results. We lost a swaybar on the first lap so the car was pretty shaky on the curves, especially when going to the left. I think we lost some precious seconds on those curves and there are a lot of curves out there, one right after another. We’ll make sure we have another swaybar for tomorrow. We’ll start inverted, starting second so, hopefully, we’ll do better in the dust. I had a chance to pre-run last week and it was rocky but not like this. It’ll be worse after today. Today, by the third lap it was worse. So, after the Trophy Trucks racing the course I think it will be very, very rocky tomorrow. People have to take care of tires and other equipment. It’s very technical and you have to be very careful out there tomorrow with your equipment. RHYS MILLEN No. 1966 (Third after Friday) — The most challenging part out there would have to be picking a pace. You can easily get fooled into making mistakes, knowing that this is a sprint-style race and that could cause you to lose a lot of time. Maybe I wasn’t the fastest driver out there today, maybe the smartest. Or, on top of that, maybe the luckiest. There was so much dust. You were constantly behind someone. You would encroach on them, ready for a pass and, then, you would hit a silty section and you would literally have to stop, probably coming to a full stop maybe 10 times each lap. The course is really technical, really fun. The second half is just like Rally Road so we were just having a blast on that. The car handled incredibly well. We raced the 1000 last year in the non-turbo class. This is our first SCORE race in the turbo class. The chassis is unbelievable. We’re really excited for tomorrow, another strong finish and, hopefully, a very good start for the 1000. We know the course might change overnight, we’re very well aware of that when the trucks and Class 1 cars run this afternoon. That’s a part of preparation. We have notes for everything and what we saw on lap three where things are changing, we will go in and change them for tomorrow to bring in that safety so you can have that speed. KRISTEN MATLOCK, No. 1954 (Leader after Friday) — Race was awesome. We had a great time. We just kept picking them off one-by-one and, finally, ended up in first physical position. We got it in adjusted time, for sure. It was race. My axel popped out on me on the first lap and we just kept going. We got really lucky on that one. We ran with three axels instead of four. I’m ready for tomorrow. DON WHITTINGTON, No. 1998 (Second after Friday) — Great race today. My brother (Tanner Timblin) did a good job, drove the race and I just got in the car at the last pit. He did a great job, rode hard. Tanner is our star of the show. On all the corners he never made a mistake. It was great for him. It was non-eventful all day long. The car ran perfect all day long which is quite nice. CO-DRIVER TANNER TIMBLIN SAID: The car handled great all day, not a single problem. Car handled great, had a lot of power, handled great. We had no issues. The course was nice, kind of rocky but fun. We enjoyed it. We’ll be back. DAN CHAMLEE, No. 700 (Leader after Friday) — It was dusty, hard to pass but we were catching these buggies all day. Every lap we’d catch a couple of more buggies and it took forever to get around them because it’s really hard to pass here. Finally, we’d get by them and catch up to another buggy’s dust. We’re faster than most of these buggies in front of us, but we can’t get through them. But, we had a good time. It’s definitely a rocky race out there which is what it’s supposed to be, I guess. There are cliffs all over the place. Two different times we took the wrong road and had to go turn around and come back again. We would be a lot faster if we hadn’t gone down the wrong road. MATTEO BOCELLI, BC-1 (leader after Friday) — It’s been a great experience racing here. It’s my first time here, racing for Baja. It was a very hard race, probably because I’m not trained enough, but next time I will be more prepared, physically. We did one mistake on a turn where there was a very high incline. We got back on the track and got going again, pretty good, I think.